Vegan or not these recipes will make you change the way you look at plant-based diets. The rise of the vegan is something which we are all experiencing, whether you take part or not, it is fast becoming a more popular lifestyle choice. The reasons are positive; environmentally friendly, ethically sound, and of course the health benefits. A plant-based diet can provide you with all the necessary vitamins and minerals required for a very healthy body and mind. A wide variety of fruit and vegetables, whole grains, beans, healthy fats, no dairy and no meat or animal products is a highly nutritious way to eat. As long as you monitor the levels of protein and fibre for example and ensure you are getting a balanced diet. 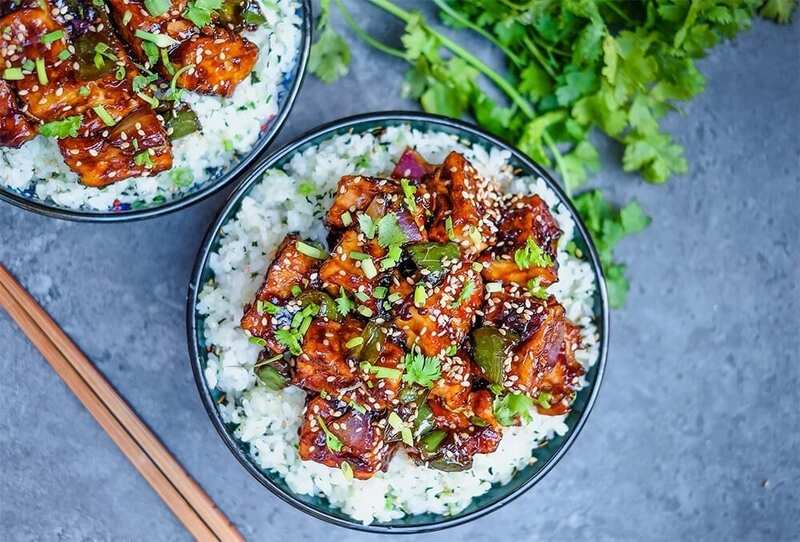 Whether you want to be vegan or not you can’t deny how delicious and nutritious these recipes look…why not give some of them a try and see if you feel like incorporating some vegan dishes into your diet? I have stuck with main dishes as there is such a wide variety and if I get started on breakfast ideas and desserts, this blog will take hours to read! A perfect mid-week lunch or evening meal for the whole family. I dare you to say you missed meat in this one! In a large bowl, combine the flour, plant-based milk, water, garlic power, paprika, salt, and black pepper. Cut the cauliflower into bite-sized florets. Dip the florets into the batter, making sure they’re completely coated. Roll them in the breadcrumbs. Line a baking sheet with parchment paper and lay the cauliflower florets on the baking sheet. Don’t put them on top of each other. Bake for 25 minutes. Remove and set aside. Prepare your tacos; lay the flour tortillas out on a flat surface, place some of the lettuce and cabbage in the centre reaching out to cover the middle of the tortilla to its edges. 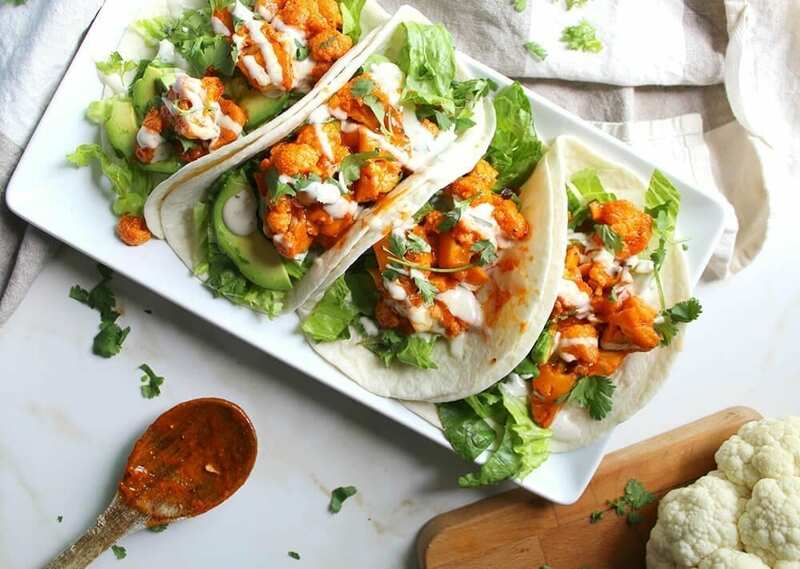 Add some avocado pieces, and some lime juice and add a few pieces of the cauliflower. Drizzle with the garlic sauce, and sprinkle with coriander and spring onions….a little more lime juice to taste. 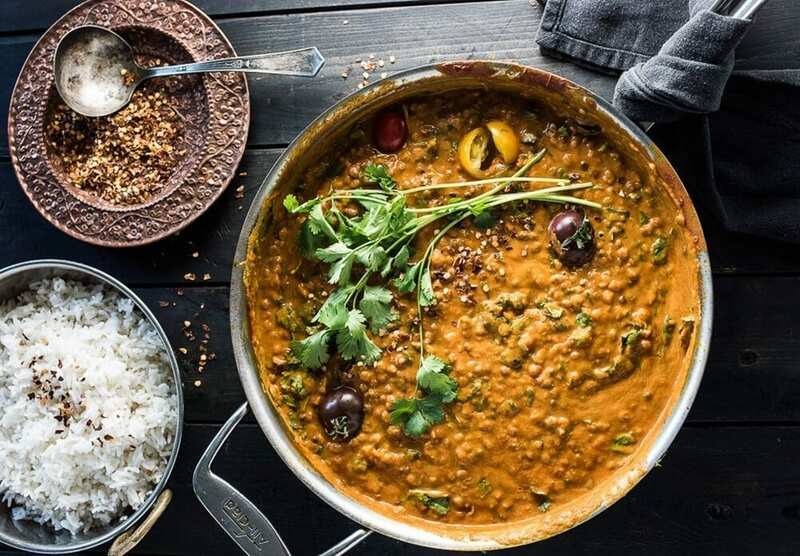 This easy to make Creamy Coconut Lentil Curry is a healthy vegan recipe that makes a perfect Meatless Monday dinner recipe. It takes less than an hour (mostly hands-off time) to make and is packed full of delicious Indian flavours. Make extras and you’ll have a giant smile on your face at lunch the next day. Delicious comfort food any day of the week. Make extra to freeze, but be warned you may eat it all in one sitting! Heat oil in a large pan, add onion and fry for about 5 minutes. Add garlic and fry for a further 1 minute. Pour in white wine (optional), vegetable broth, tamari (or soy sauce), and the spice mixture. I love adding nutritional yeast flakes as well but that’s optional! Bring to a boil. Add fresh thyme leaves and/or parsley and/or tarragon to taste! Enjoy with brown rice, pasta or mashed vegetables of choice! This vegan jambalaya with beans and vegetables is the ultimate comfort food from the South! It’s super easy to make, so delicious and packed with proteins! In a large pan, heat some oil and sauté the red onion for about 2-3 minutes. Add the garlic and cook for another minute. Then add the bell pepper, the celery, and the vegan sausage. Cook for another 3 minutes. Stir in the cooked rice, the kidney beans, the crushed tomatoes, the spices, the soy sauce, and the Tabasco and cook for about 5 minutes. Season with salt and cayenne pepper and stir in the green onions and the chopped parsley. 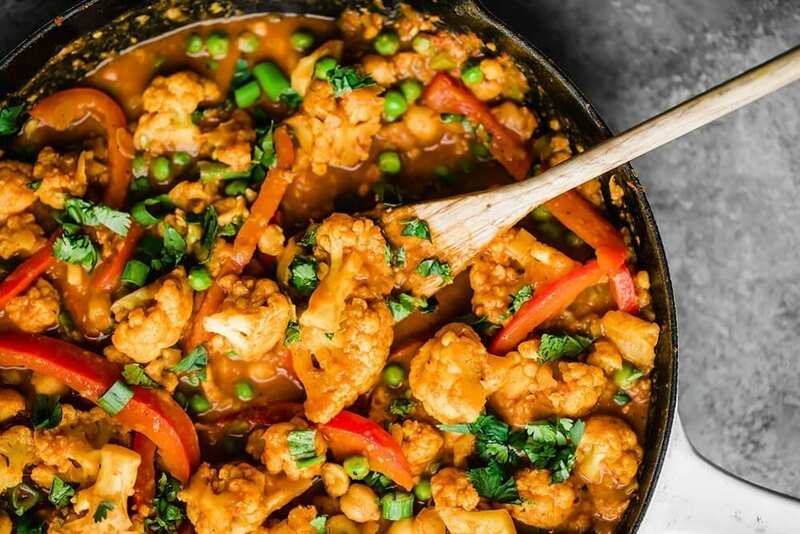 This delicious Thai peanut coconut cauliflower chickpea curry is packed with bold flavours and plant-based protein. 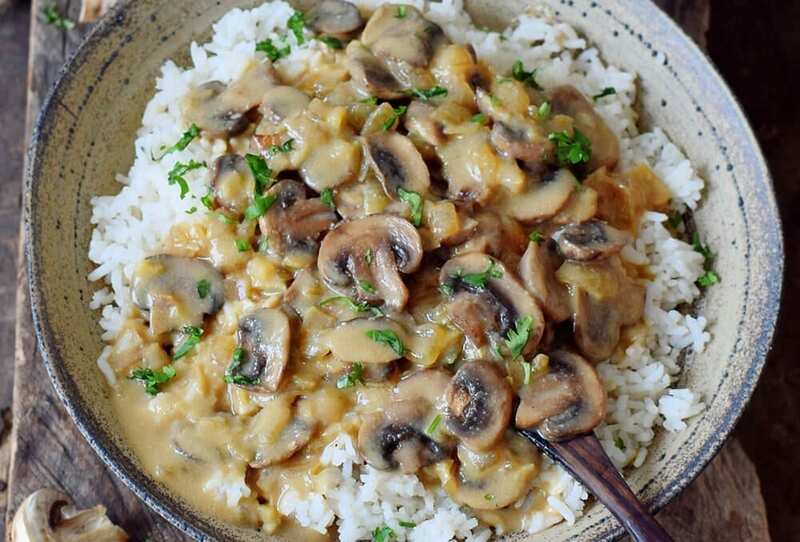 Make this cozy, vegetarian dish in one pan for the perfect weekday meal! Place a large deep 10 inch deep skillet or a large pot over medium high heat. Add in coconut oil, garlic and ginger and cook for 30 seconds, then add in green onion, carrot and cauliflower florets. Sauté for 3-5 minutes until cauliflower begins to turn a slight golden brown and onions soften. Next, add in coconut milk, water, curry paste, peanut butter, soy sauce, red cayenne pepper, turmeric, and salt, and stir well to combine. Then stir in bell pepper, and chickpeas; simmer over medium-low heat for 10 minutes. Taste, and adjust seasonings as necessary. Before serving, stir in frozen peas and simmer an additional minute, then pour into bowls or divide into meal prep containers. Garnish with cilantro, spring onion and chopped peanuts/cashews. Great with brown rice or quinoa for a full protein packed plant based meal. This is a great quick and easy tofu recipe, try it out on some friends over lunch. Serve with an asian style coleslaw. Dry the tofu and cut into cubes. I wrap the tofu in towels and place a plate on top of it until excess liquid is absorbed by the towels. Sprinkle the salt on the tofu cubes. Add the cornstarch. Coat the tofu well. In a bowl, mix all the ingredients for the sauce. In a pan, heat around 1 1/2 tbsp of oil and then fry the tofu cubes until crisp and golden. You may need to turn them as they cook. Take out the tofu and sauté the spring onions and bell peppers in a little oil. Add in the tofu, sauce, and then mix well. The sauce will thicken from the corn starch. Serve with a bowl of rice and enjoy while hot! Here at the School of Natural Health Sciences we offer over 60 holistic therapy courses and some of our most popular courses are our nutrition based ones. We’ve recently added Plant Based Nutrition to our portfolio of courses to cater to the growing demand for knowledge about this topic. Our Vegan and Vegetarian Course is not only fantastic for a therapists portfolio it can also be used as a ‘Self Help’ guide if you wish to learn about changing to a Vegetarian or Vegan lifestyle for yourself or your family! Don’t miss our Special Offers – we have a “2 for 1” offer on all our Nutrition Courses. Contact us with any questions you might have, we’d love to help!